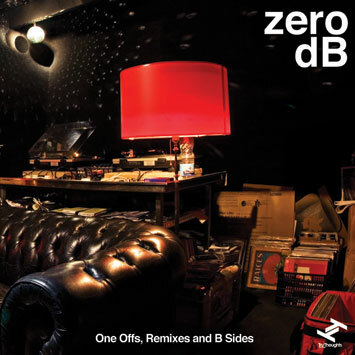 As if the mere prospect of a new release by Zero dB weren’t enough to get tongues wagging and feet dancing, this 2 CD, 23 track monster boasts the best of a truly humungous catalogue of remixes courtesy of luminaries including Moonstarr, Aaron Jerome and Seiji among others. It also heralds a first and eagerly-awaited CD release for a handful of highly sought-after cuts – not least Hextatic’s Distorted Minds (Zero dB mix), the Dave Da Gato Mix of “Seven By Seven” by Inverse Cinematics and the almighty Zero dB classic, “The Snare” – that were previously only available on limited vinyl and all snapped up by eagle-eared fans way back when. And, in addition to the big names and rarities on this latest addition to Tru Thoughts’ esteemed ‘One Offs…’ artist compilation series (which has previously seen Bonobo, Quantic, Nostalgia 77 and Domu dust off some of their best kept secrets for the fans), there’s also a healthy sprinkling of completely new and exclusive material including the immense Dave Da Gato’s F_ck-Up The Festivals Bounce version of “Universe” by Alice Russell, bringing the soul diva/national treasure’s song to the heady, neck-snapping heights of euphoric club nastiness. As any avid follower will know, the Zero dBoys, Chris Vogado and Neil Combstock, have been keeping busy at the cutting edge singe the release of ‘BB & B’, making killer club music under various monikers, many of them to be found on this record, and packing out dancefloors with DJ sets in some of the biggest clubs and best soundsystems known to man, including Plastic People and Japan’s Club Yellow. Vogado, now living in Barcelona, runs the boutique Fluid Ounce label from his legendary Fl. Oz. Studios, and Combstock has also seen his muse lead him round the globe, living, DJing and making music variously in Japan and Thailand among other places. Zero dB’s ‘One Offs, Remixes and B Sides’ is not only an essential listen for existing fans of Zero dB’s unique concoction of Latin heat, jazz colour, startling beats and pure bassline filth, but for anyone who has been remotely moved by dance music in the last half decade.